Bell today announced the countdown to the start of Clara’s Big Ride for Bell Let’s Talk on March 14. 109,451,718 tweets, texts, calls and shares: Thank you Canada for another record setting Bell Let’s Talk Day! With 8 days to go until Bell Let’s Talk Day on January 28, Bell thanks the many leading Canadian companies and associations helping to spread the word about Canadian mental health. To celebrate the 25th anniversary of Kids Help Phone, Bell and Kids Help Phone today announced the largest-ever corporate donation in the organization’s history. Bell Let’s Talk Day 2014 is January 28: Join the Canada-wide conversation about mental health! Bell today launched the 2014 Bell Let’s Talk campaign in support of Canadian mental health, highlighted by the fourth annual Bell Let’s Talk Day on January 28. 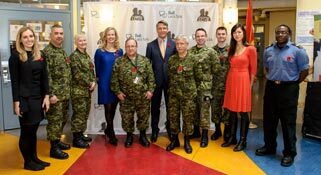 Mary Deacon, Chair of Bell Let’s Talk and Michael Burns, Vice Chair, True Patriot Love with members of the military at the announcement of the first Bell True Patriot Love Fund. Bell has been honoured by Excellence Canada with a Canada Award for Excellence in recognition of its workplace mental health program.